If you need a natural insomnia remedy, look to tasty tart cherry juice. Sleep will come easier, according to research. Studies show that tart cherry juice can help you to sleep longer and better. You may be familiar with tart cherries if you like to cook. Tart cherries (also known as sour cherries) are used in dishes like pies, preserves, soups, cakes, tarts, sauces, mixed cocktails, and more. But did you know that these tasty fruits might also help you get a better night’s rest? Two of the most common varieties of tart cherries are Montmorency and Balaton, which often come from Michigan. They are more sour than sweet cherries like Rainier, Bing, and Lambert cherries. They also are believed to have higher antioxidant contents than sweet cherries, giving them the potential to have stronger health benefits. Tart cherries are rich sources of antioxidants, in particular anthocyanins, which are responsible for the purple pigmentation of these fruits. They possess a strong antioxidant capacity as well as anti-inflammatory qualities, making them disease-fighting tools. Tart cherry juice concentrate, specifically, seems to have the highest antioxidant and anti-inflammatory activities compared to frozen, canned, or dried cherries. Tart cherries are a natural source of melatonin, the sleep-promoting hormone. After eating tart cherries, melatonin levels rise significantly in test subjects. And studies show that this increase in melatonin translates into improved sleep. In one study, 20 participants were given either placebo or 30 ml of concentrated tart cherry juice within 30 minutes of waking and 30 minutes before bed each day. The cherry group saw significant increases in time spent in bed, total sleep time, and total sleep efficiency. People who drank cherry juice slept an average of 39 minutes longer than those drinking placebo. In another study, people with insomnia drank two 8-ounce servings of tart cherry juice in the morning and the same before bed for two weeks. Scores for insomnia severity were significantly reduced after supplementation. 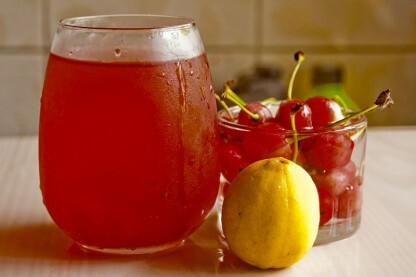 Participants also woke up fewer times during the night after drinking tart cherry juice. The authors concluded that tart cherry juice helps adults with insomnia. It should be noted that this study was funded by CherryPharm, Inc, a company that makes tart cherry juice. Because of these effects on sleep and insomnia, sour cherries have also been touted as a good, all-natural remedy for jet lag, to be used on long travel days where you have to change time zones. If you suffer from insomnia and feel like you’ve tried everything, give the tart cherry juice sleep solution a try. Tart cherry juice may be the easiest and most convenient option; you’d have to eat a whole lot of fresh cherries to equal a few ounces of juice. Drink a cup about an hour before you head to bed, or else twice a day (one in the morning and one before bed). Look for a high quality tart cherry juice (without added sugars) or tart cherry juice concentrate at your local health food store, and follow the recommendations on the bottle. Have you ever used tart cherries for medicinal purposes? Have you ever used a cherry juice sleep remedy? Do you eat them whole or drink the juice? Share your experience with tart cherries in the comments section below. J Food Sci. 2012 May;77(5):H105-12. J Med Food. 2010 Jun;13(3):579-83. Scand J Med Sci Sports. 2014 Jun;24(3):477-90.
anti inflammatory, antioxidant, antioxidants, cherry juice sleep, cognitive behavioral therapy, exercise, food, gout, gout symptoms, health, health food, home sleep remedies, hormone, how the color of light affects your sleep, insomnia 2, melatonin, natural remedies, natural remedies for, natural remedies for insomnia, natural remedy, recovery, remedies for insomnia, sleep, sleep remedies, stay asleep, studies show, tackle what causes insomnia with cognitive behavioral therapy, tart cherry juice sleep, what causes insomnia. My husband swears by tart cherry juice for deeper, better sleep, and has passed the idea on to others who also now are believers. My husband has been drinking cherry juice for the past four years since we vacation in Michigan. We visited a cherry farm in the Traverse Bay Farm region of Michigan and talked with the farmer himself. He told us and we swear by it now. This product taken at bedtime can cause sleep apnea. For me it causes periods of time during sleep that breathing is greatly reduced and weakens and lowers heart beats. Causes slight headache until regular breathing returns.